What I still share today is the passion for Nordic (or Scandinavian) boat building tradition. It is great, that there are still so many top sailing yachts built in Finland, Sweden and Denmark. This blog post lists six of my 'dream boats' in the size category of 34 to 37 foot, which I consider roughly the ideal size. None of these models are manufactured anymore, so the only way to find them is from second-hand markets. A problem with the new and hand-made Scandic boats is, that their price has elevated compared to their rivals from central Europe. However, if looking for about twenty years old boat, the price is not astronomical. Often the choice might be made between new (or almost new) central European boats, or 20+ years old Scandics. It is good to note, that this listing does not attempt to be a realistic list of options for us — especially as we are not searching for a new boat at the moment. Merely, the boats listed here are ones that have caught my eye somewhere, and I have wanted to find more information on them. This boat might be a rather hard to find on the market, but there was one Baltic 35 (Judel/Vrolijk design) from 1985 actually on sale last year in Finland with a price tag of about 100 000 €. With a recently replaced teak deck, she looked just stunning and I was hungry to seek more information. Based on the plan and photos, the interior looks very cleverly designed and roomy for her size. There is a decent chart table, the galley is very well organized and the aft cabin is spacious due to the fairly large bridge deck. On the other hand, the cockpit seems to be a bit small and sprayhood does not give good protection for the cockpit and helmsman. There is also a shortage of locker space in the cockpit according to the test article by Vene-lehti (9/85). The boat has sandwich-structure in the hull and deck with balsa as a core material. This is a minus in my books, but I think that Baltic Yachts — if any yard in the world — knows how to make a proper boat with this structure. In production 1984—2001. One example on sale (in USA) at 88 000 €. This model was introduced in 1990, and remained in production for sixteen years. During the years, the model has been upgraded a lot. For example, the early 34 did not have a windshield or bathing platform and the long galley was on the opposite side of the sofa. These and other features were improved during the first years of manufacture. Of HR 34's I would be especially interested in post-1994 models — that's when the bathing platform was added. In HR34, I like especially the simple fractional rig, which is supported exceptionally well. The 28 hp engine is powerful, and tankage (water & fuel) is sufficient. I believe that she is an example of a rather small cruising boat, which is capable of taking her crew anywhere with comfort, style and relatively good speed. Furthermore, a tiller steering is a definite plus in a boat of this size. +10 boats on sale in Europe, early models start from 90 000 €. The HR 36 was only the second HR, which was designed by Germán Frers. Compared to the HR 34, the 36 is more conservative with her center cockpit, masthead rig and a semi balanced rudder supported by a partial skeg. Tankage is very generous and this, among other qualities, makes her a great choice for blue water sailing — and even sailing round the world, if you like. In production 1989—2003. +10 boats on sale in Europe, early models start from 100 000 €. Malö is a top brand in sailing business. The yard is located in Kungsviken, Orust — the mecca of Swedish boat building. Compared to its neighbour yard in Ellös, Malö's production is in smaller scale, and therefore the company can offer better customization for its customers. Therefore it is rare to find two identical Malö yachts. Malö 36 is a very beautiful looking boat, dedicated purely for comfortable cruising lifestyle. The targa arch is a trademark feature for Malös and together with the windshield, makes the cockpit very well protected. Furthermore, because the mainsheet traveler is located on the arch, the cockpit is also mostly line-free. Malö 36 was in production 1996 - 2006. Three boats on sale, prices from 195 000 €. This 'Baby Swan' is actually almost 37 ft long, but was named after the classic Swan 36 (S&S). Her large cabin wraparound skylights make the new Swan 36 distinguishable in the Swan family. This model has caused some controversy among sailing folks, but I have always liked the rather modern looks of this boat. Tankage is sufficient for most cruising sailors, but still less than half compared to the HR 36. The cockpit is large compared to some earlier Swans, and there is no bridge deck in front of the companionway. The hull is solid hand-laid fiberglass, which is a definite plus in my opinion. 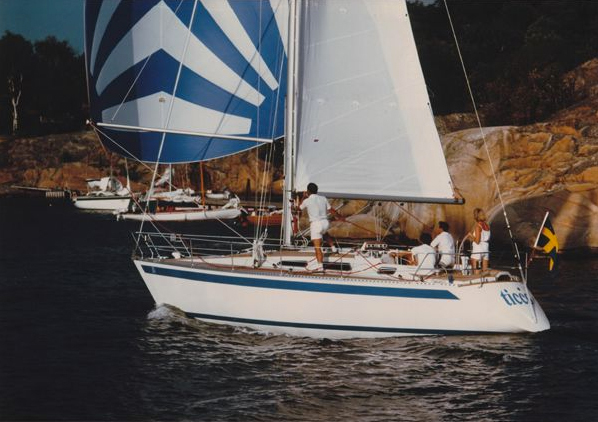 Swan 36 was in production 1988—1996. Two boats on sale, asking prices 114 000 & 145 000 €. 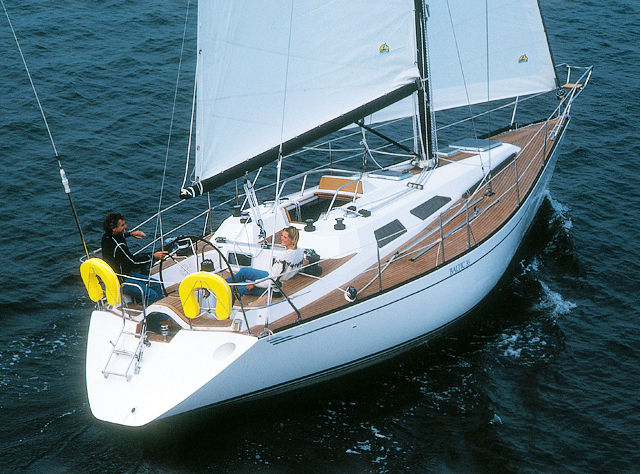 The SY340 was built in Swedish West Coast for demanding offshore sailing. She was designed by Peter Norlin, and although built originally according to the IOR-rule, is fairly moderate in this respect. As always, Norlin has succeeded in drawing beautiful lines for this boat. 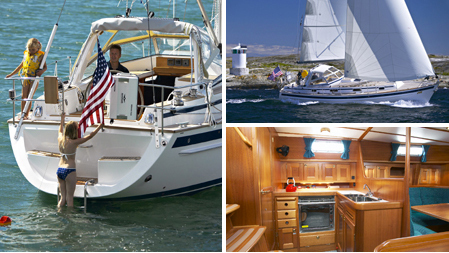 The interior is traditional and designed to work at sea. She has a decent chart table, and the galley seems very functional and safe at sea. There is a small bridge deck, and the aft cabin is large for the boat of this size and era. Like in Baltic 35, the hull and deck are of balsa sandwich structure. The SY340 was in production between 1986 and 2002. Five boats on sale, asking prices between 56 000 € — 116 000 €. This listing does not attempt to be conclusive in anyway. What is common for all of the boats listed here, is that they are sturdy boats, designed especially for offshore. Also, another common feature is a beautifully made teak or mahogany wooden interior, which is typical for almost all Nordic boats – when down below, one has basically no idea of being inside a plastic boat. However, otherwise the boat's design philosophies differ quite a lot; for example the Baltic 35 is a Cruiser/Racer of the 80s, whereas HR 36 and Malö 36 are purely designed for cruising lifestyle. What is your dream boat or have you already got one? What boat(s) should be included in the list? It would be also interesting to hear suggestions of non-Scandinavian boats, which are less known here. To these models i would add one more sailboat, Scanner,http://www.scanyacht.se/. Last summer, in Finland, one Scanner 391 was on sale, but it wasn't updated, and the price was too high. (120 000€) It should have updated it's electricity, navigation device and sails etc. Thanks for the link ullao - Scanner 391 is a real beauty! She and her little sister Scanner 361 could very well be included in the list. I think that the problem with these low volume manufacturers is that it is hard to find these boats on the market. And if there are only one or two boats on sale, there are of course fewer options available than when buying a boat from a bigger manufacturer. On the other hand, one only needs to find that one pearl. My absolute favorite (if I was a rich man as in the song) would be a Linjett 40 from Rossätra varv. Unfortunately this will remain as a dream I´m afraid. Yes , I have also always liked the traditional lines of Linjett very much. Actually, Linjett 33 could very well be included in my list of dream boats. Great looking boat in my opinion, tiller steering, interior looks cosy, functional and well made. Very good addition to the list indeed! There are too many boats and not enough time (and money). Nice list. I like the Frers Swan as well. Being a Norlin man myself, I've always admired Norlin 37s and Omega 42s, which is by the way pretty shorthandable with a self tacking jib. Have to add that I agree that the balsa core construction on Baltics is a big minus, although I really like how the C&C designs look like. Baltic 37 would be high on my list of desirable boats, although the mast head rig with huge genoa calls for more muscle than I've got. Hi Timo, Omega 42 is a great boat indeed - I saw couple of those last year in Sweden. Norlin 37 I do not know very well. I agree on what you say about those big genoas. That is a minus in old Swans and Baltics. However, Baltic 35 has a fractional rig so the genoa is probably bit easier to handle. I wouldn't worry too much about the big genoas. When you're not racing, you might as well use the n:o 3, which in no way is too big for a regular familycrew. Or use a roller, which you then just roll in as the wind builds. I'm a bit biased as regards to the Swans and Baltics, so I can just say good things about them. I think that every boat is a compromise, and the masthead rig vs. partial rig is among one of them. For a 'perfect' all-a-around boat, I would probably choose a 19/20-rig (or similar), which has a large mainsail and a jib plus easily deployable gennaker and code 0. Or alternatively a cutter-rig would be a good option as well. But there are so many great boats, which have a masthead rig with those big genoas, so I thing that one can learn to manage that if the boat is otherwise perfect and meets the needs. For blue-water sailing, I think that a masthead rig is an optimal choice. SY 340 has balsacore till water line. What do think about the large genoa 46 m²? Is this boat good in the archipelaco? Yes, the balsa core in SY or Baltic is a minus, but the foam cores can have problems as well. So in this respect I value the solid fiberglass hull of Swan very much. I agree that those large genoas in masthead rigged boats such as the SY 340 and Swan 36 are not the optimal choices for the archipelago. When talking about sailing in the archipelgo, it is a pity, that many good offshore boats from that era have a masthead rig. Quite hard to find a suitable boat as the next boat. MP 34 and 36 interests also me but only 2+2 has been made. I just met Maestro 35 skipper who had problems with balsa hull. Baltic 35 would be a dream without balsa in the hull. Interesting, I thought that Maestro 35 has a solid hull, but according to the Venenetti, balsa sandwich structure on hull was an extra feature – on which one had to pay FIM 10 000 mk more (in 1992). I am not sure if that was a good investment? Maestro's deck has divinycell foam as a core. I also like the MP-boats very much...MP 42 was the boat of my loca sea scout troop. Beautiful and sea-worthy boats. However, I guess that the mahogany hull can have its own pitfalls as well, in case there is water intrusion. In general, balsa cored boats are very common even today and on the other hand, foam cores can have problems as well. So I guess that in the end, the overall build quality or how the boat is made initially is more important in the long run. We have an Omega 34, 1983, designed by Ron Holland. Fast, reliable and a great family yacht. Water and diesel tanks slightly under dimensioned for longer voyages, but perfect in Scandinavian waters. 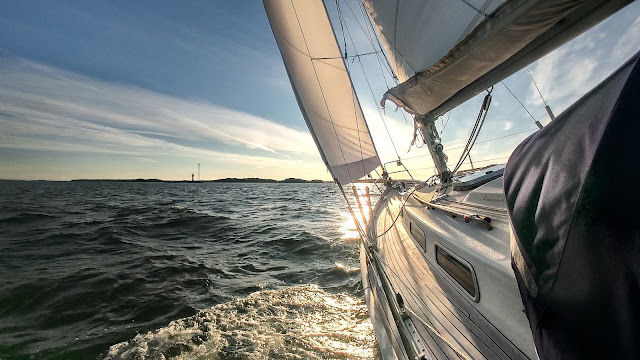 We have been looking for a Sweden Yachts 34, whose deplacement is 6 t compared to 4½ t for our Omega 34, assuming that such switch will allow longer voyages (generally better craftmanship is also expected, when comparing the two - fair?). For price reasons we have been looking for a Kenneth Albinsson designed 1983 version (it seems from the above that Norlin only took over from 1986?). Any comments on these older versions - does it make sense to switch from an Omega 34 to a Sweden Yachts C34, when the idea is to do some blue water sailing and longer voyages shorthanded? Or is our Omega 34 just as good hull and structure wise? Thanks for your comment! Unfortunately I have no first-hand experience on the Sweden Yachts C34 nor the Omega 34 so you might get more valuable comments from various internet forums for example. But I try to answer your questions as well as I can. 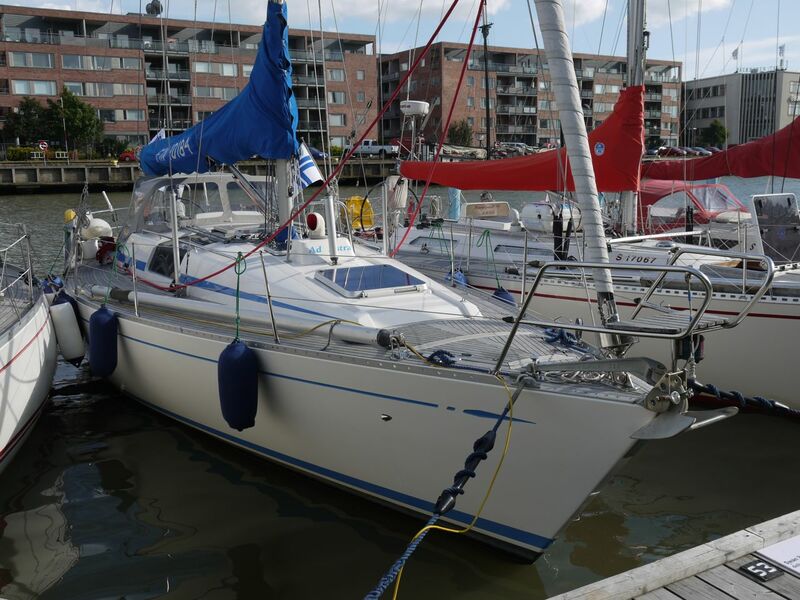 When looking on the specs of these two boats, it seems to me that the Omega 34 was designed more for the Baltic Sea/Archipelago cruising, whereas the Sweden Yachts for offshore racing/cruising. Tankage in Omega 34 is insufficient for longer voyages as you mentioned. C34 is better in this respect, but the 100 l fuel tank could be bigger in C34 as well. Based on the reputation and the image that I have, I would consider the C34 sturdier and more heavily built boat, and I think that the weight difference also tells about that. I guess that both of these boats are included in the Curt Gelin's book "700 segelbåtar i test", so if you can find the book, I think that you will find valuable information there. I guess that pretty much all the C34's have a teak deck, so the condition of the balsa sandwich deck core is always a question mark and requires careful inspection. According to the sailguide.com, C34's hull is solid spray-up glassfibre "skrov i sprutat enkellaminat", so no sandwich structure in the hull. Of these two boats, I would opt for C34 for longer voyages. So with some reservations I would say, that your switch makes sense. However, you know and have tested your current boat well whereas a new boat might have hidden issues. If you're interested in C34/SY340, you might be interested to check out Cenit 33 as well. However, unfortunately the fuel tank is quite small (60 litres) in Cenit. Thanks for prompt response and valuable thoughts. Having reviewed the Cenit 33 specs., it appears to me that the Cenit 33 is strongly inspired by the Omega 34 although the Cenit is 10% wider and some one feet shorter than the Omega. The Omega has a better keel percentage (2 / 4½ compared to 1.8 / 4.7), so I guess that it comes down to personal taste and preferences and personally I prefer a longer and leaner hull and as high keel percentage as I can get. However, I am keen on hearing comments from sailors having visited the Shetlands and the Faroe Islands in Omega 34 / Cenit 33 types. Has the deplacement shown to be sufficient to provide a reasonably safe trip? I agree with you that long and relatively lean hull and enough displacement are positive qualities in a cruising boat. These same things were pretty much in my mind, when looking for our current boat four years ago. It seems to me that Omega 34 has pretty good specs in this respect. For example the Capsize Screening Factor is very good: 1.81, according to the sail calculator (http://www.image-ination.com/sailcalc.html). Unfortunately, I did not find corresponding figures for C34 or Cenit. I think that the displacement has more to do with the sea kindliness than safety, which among other things depends more on the structural quality. The preference for sea kindliness (perhaps at the cost of speed) is a matter of personal taste as you mention. The practice of announcing boat's displacement varies a lot depending on the manufacturer. For example our boat's book value is 3,800 kg, but in reality she weights probably over 5 tn. About Cenit: our local boating magazine tested the boat Cenit in 1993, and they measured the weight to be 5,200 kg. Unfortunately, they haven't tested the Omega 34. I guess I already have my dream boat. just would like to upgrade my standing mast to a taller one and inmast furling.